With the playoff season upon us and the Super Bowl just around the corner, hot wings and other finger dipping appetizers are kind of a big thing around this house. 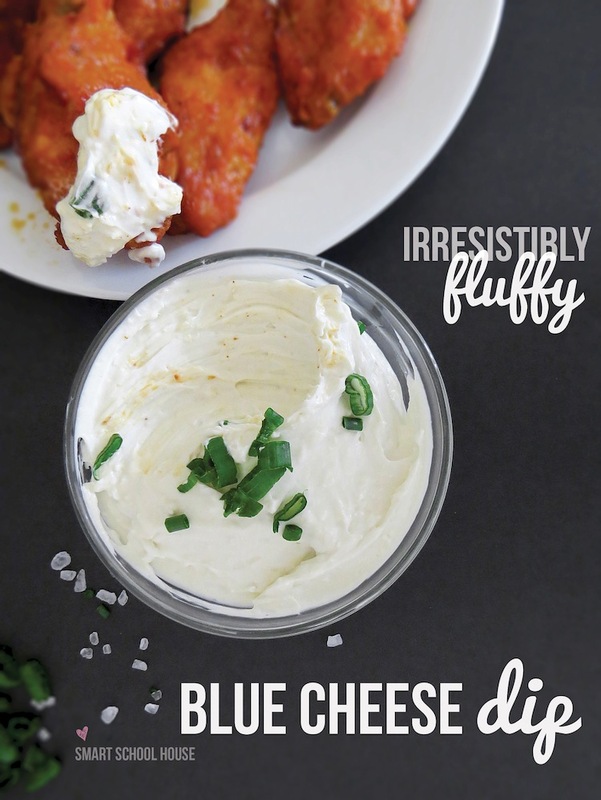 Today I am sharing our irresistibly fluffy homemade blue cheese dressing recipe! What is more fun than munching on hot wings and enjoying some ice cold beverages during a great football game? We LOVE that!! This blue cheese dressing recipe is so delicious and flavorful that you’ll want to make sure you have it ready for Super Bowl Sunday, especially if you’re hosting a Super Bowl party! It’s simple, fluffy, and seriously, The Best Blue Cheese Dressing Ever. Whip up the heavy whipping for 1-2 minutes on high with a stand or hand mixer until it becomes thick. Set it aside. In a food processor, puree the cream cheese and blue cheese together. Combine the whipping cream and the blue cheese/cream cheese puree together using your stand or hand mixer. Put the homemade blue cheese into a small bowl or ramekin for dipping. Sprinkle the green onion on top. Thanks Kelly for this delicious recipe. I am definitely making it for our Super Bowl party! I love looking at your blogs for inspiration!